What makes some blogs so wildly successful, earning seven-figures per year? 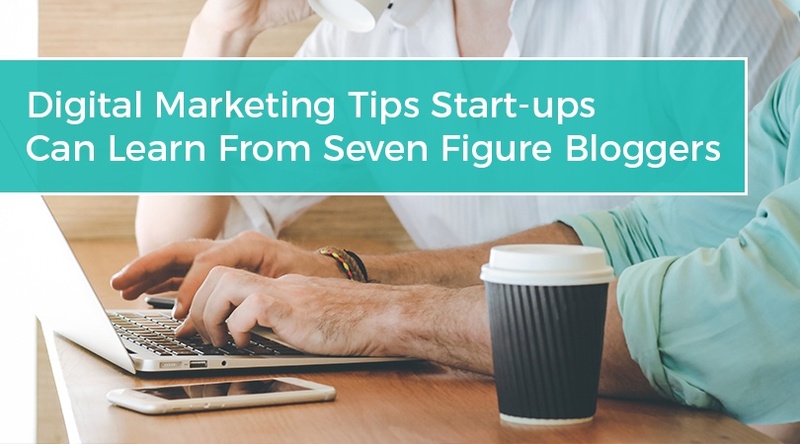 And, what can start-ups learn from these seven-figure bloggers? High-level bloggers know how to reach their audience with valuable content and nurture relationships with their readers. But, without digital marketing, seven-figure bloggers wouldn’t have a business. Judging by their success stories, they are digital marketing pros. Seven-figure bloggers have perfected digital marketing and the inbound marketing methodology. They attract their specific target audience, convert them into subscribers and followers, and they delight them with consistently high-value content and messaging. Depending on whether or not they sell courses or coaching, bloggers may or may not have “customers.” Nevertheless, they know the value of serving their audience by building relationships and trust with their audience and creating content that meets the needs of their readers. The commonality among high-level bloggers and internet start-ups is that both use the internet to reach their target market. The top players in the blogging world have valuable lessons to teach start-ups. In most cases, successful bloggers spent years building their brand. They all started at zero, the same place you are starting at now. By following their lead, you can save the time and frustration of figuring it all out yourself. The top players in the blogging world have their branding down to an art and a science. They have invested time in fine-tuning the image and the voice that connects with their audience. Their mission and purpose are crystal clear, and they understand the needs of their subscribers which enables them to deliver the right information that attracts the right readers. They serve a specific niche and have a laser focus on serving that audience. How can you write to your ideal buyer in a way that will compel them to make a change? How does your product or service help your buyer make that change? Your marketing must answer these questions. Creating a buyer persona is a step that companies often skip. Start-ups may feel like they know their audience well enough to start marketing to them. Writing out your buyer persona may seem like busy work. We often have clients who think it’s unnecessary since they know in their mind who their ideal buyer is. But, here’s the deal… Your persona is EVERYTHING. And, the content and messaging that you write when speaking to them is EVERYTHING and a bag of chips! So, do not pass Go until you have done in-depth research on your ideal buyers. This one piece of critical intel will inform everything you and your team do to connect with your buyers. Then there’s the science. Using SEO best practices and analytics tools, high-level bloggers use data to help them make decisions about their audience’s needs and the keywords to target. From this data, they determine the content to develop and promote that will attract their ideal readers. Over time they become thought leaders and authorities in their industry because they have put in the work to build relationships and trust with their audience. Depending on the nature of the blog, you’ll find that readers want to be entertained or educated. Highly successful bloggers know that and invest the time and effort to create focused content to meet their readers’ needs. Check out Pat Flynn’s blog, Smart Passive Income. You’ll see that many of his articles are tutorials or instructions on how to do the work that goes into building an online business. He has built a huge following and a six-figure monthly income by educating his readers on a subject about which they are passionate. Quality and consistency are more important than quantity when it comes to content. Commit to producing high-quality, relevant content on a consistent basis, and your readers will come to depend on you for a regular cadence of fresh content. You’ll build a loyal following of readers who are always hungry for more. In a recent interview on FITnancials, Michelle Schroeder-Gardner of Making Sense of Cents advised that you “spend 20% of your time creating new content and 80% of your time promoting it.” Writing and publishing content is very time-consuming. Learn the best outlets to share and promote all the content you worked so hard to create. What social media or content-sharing platforms does your audience use? Spend time getting to know your target buyers’ online habits and develop a strategy to reach them on those platforms. A focused content promotion strategy will help you work smarter, not harder. There are two things you own completely: Your website and your email list. Social media outlets may come and go, and algorithms may change, but your list is yours. Successful bloggers know the power of email marketing. Recently Julie Stoian, a seven-figure digital marketer and blogger, was banished by Facebook. Her personal profile, and thus all of her ad accounts, were deleted. Years of posts, images, and ads were erased. She was devastated, but fortunately, she has been building her email list along with her social followers and group members. She was able to quickly send out an email to her subscribers alerting them to the issue. Because she has been nurturing her list, she received a tremendous response, and her dilemma made her loyal subscribers rally around her. They respect their contacts and are thoughtful in the way they communicate with those on their email list. They don’t overstep their welcome by emailing too frequently or emailing irrelevant information. They build relationships with their followers with consistent, high-value email content. They give more than they expect in return. Fail to follow these best practices, and you’re likely to be plagued with a high unsubscribe rate. Seven-figure bloggers are strategic in using email in their marketing. Besides consistently sending valuable information, they use links to bring readers back to their website. They make it easy for readers to share their emails by using social share buttons. They offer content that isn’t available anywhere else but via email; their subscribers are treated to the very best information. Data is your friend, but can also be your enemy. The best bloggers write for their audience, not for search engines and sponsors. If you write with the sole intention of ranking in Google, you’re at risk of alienating the very subscribers who gave you their trust. Want to build your rank on search engines? Become THE authority in your niche. Create content that others will link to and share all over the internet. BE the expert in your industry and educate your audience and then market that expertise. It sounds simple, but it is a long-term game. Don’t expect overnight success. Be willing to build your authority over time by earning the respect and trust of your audience. Keep innovating and honing in on what your buyers want and be willing to be ahead of the curve and offer products and services that you know meet their needs before they even know they have those needs. Be the leader in using specific terms and phrases in your industry. Be the one that coins the phrase and uses it repeatedly in your marketing, before it’s ever a keyword and when there’s zero search volume for it. In digital marketing, there are always innovations and new methods of reaching your audience as we all learn what works and what doesn’t – today. What works tomorrow may be different, and you have to be willing to pivot. Successful bloggers know this and will adjust their strategy, not at the whim of new trends, but because they keep their thumb on the pulse of their audience. Start-ups must be willing to make adjustments in their marketing strategy as they go through the phases of their business’s growth and learn more about their audience, their needs, and the best methods to reach their audience. Start-ups have much to learn from successful bloggers. These tactics are not difficult to replicate in your own business. Start with a clear vision of your purpose and mission, a deep understanding of your prospective buyers, and then consistently create and promote content with their needs in mind. Use analytics and data to inform your marketing strategies and make adjustments when necessary. You’ll see your audience grow over time as it has done for the most successful bloggers. Need help developing a digital marketing strategy for your business? Contact us for a consultation, and we’ll put the power of the internet to work for your business with proven SEO practices and content marketing strategies.